You'll be £25.00 closer to your next £10.00 credit when you purchase The Rise and Fall of the Japanese Imperial Naval Air Service. What's this? This book describes in considerable detail the people, events ships and aircraft that shaped the Air Service from its origins in the late 19th century to its demise in 1945. The formative years began when a British Naval Mission was established in Japan in 1867 to advise on the development of balloons for naval purposes. After the first successful flights of fixed-wing aircraft in the USA and Europe, the Japanese navy sent several officers to train in Europe as pilots and imported a steady stream of new models to evaluate. During World War One Japan became allied with the UK and played a significant part in keeping the German fleets of ships and submarines at bay in the Pacific and Indian Oceans. However, in the international naval treaties that followed they felt betrayed, since the number of capital ships, battleships and cruisers, that they were allowed was below those of the USA and the UK. Aircraft carriers were not included, so a programme of carrier building was started and continued until World War Two. At the same time they developed an aircraft industry and at the beginning of war their aeroplanes were comparable, and in some instances superior, to those of the British and Americans. Much pre-war experience was gained during Japan s invasion of China, but their continued anger with America festered and resulted in their becoming allied with Germany, Italy and the Vichy France during World War Two. There followed massive successful attacks on Pearl Harbor, the Philippines, the Southern Islands, Port Darwin and New Guinea. The British were decimated and the USA recoiled at the onslaught, taking over a year to regroup and take the war to the Imperial Japanese forces. Throughout the conflict many sea battles were fought and the name Zero became legendary. When Japan eventually capitulated after the Atomic bombs were dropped the Japanese Imperial Air Service was disbanded. An immensely detailed account of how the Imperial Japanese Government embraced the concept of Air Power and how they developed Naval Aviation from before WW1 to the final defeat in 1945. This book is a triumph for Peter Edward's son Richard. The book is a definite must for anyone interested in Japanese aircraft development and I definitely recommended it. New material previously unpublished is included, within an extremely well-written narrative history. Edwards' work goes well beyond the dramatic images of the Japanese World War II air power unleashed at Pearl Harbor, the infamous Zeros, and desperate bravery of the kamikazes which have become an indelible part of popular history. 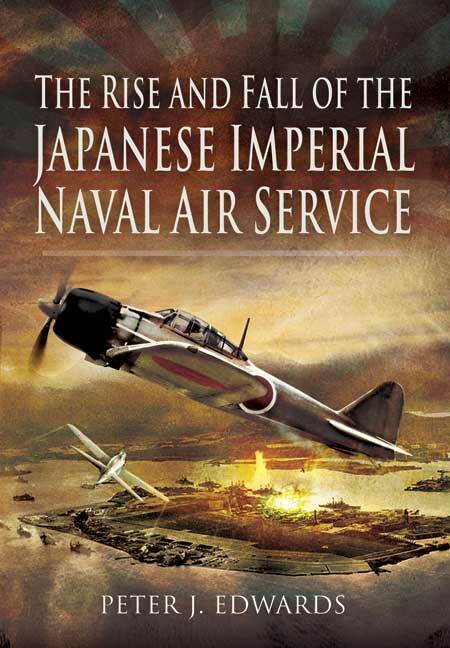 Although the "rise and fall" phrase of the title denotes the bulk of the content, the book is a history of Japanese air interests and air power from their origins and early developments preceding World War II. The growth of Japanese air power both paralleled and interacted with the growth in European countries and the United States. In close cooperation, Japanese engineers, military planners, politicians, and industrialists--and Japanese royalty too--pursued their country's path of development as they were also taking what they could from Western aircraft design, manufacture, and tactics and sometimes working directly with Westerners. Like Western military aviation, Japan's began with balloons. About the time when these were first employed in warfare in Western nations, Western countries already had diplomatic missions in Japan. The British opened a diplomatic mission in the 1860s. And in World War I, Japan was an Asian ally of Britain and the Allies which used early war planes to bomb German warships in Chinese harbors and disrupt German naval activity in the Pacific. After World War I, Japan participated in aviation testing programs in the United States while keeping up with the most advanced aviation developments in England and Germany. At the outbreak of World War II, Japan had an advanced, well-trained, formidable air force as a part of its Imperial Navy. The air force was closely associated with the Imperial Navy because it had concentrated on building aircraft carriers since these were not covered specifically in the global disarmament following World War I.
Peter Edwards served in the RAF from 1945 and later became a school teacher. He maintained a life-long passion for military history and has had numerous magazine articles published.